On one level, Manlike is an encounter between sound and motion. George Koulas vocalises a stream of stutters, cries and whispers while dancer Milena Ugren Koulas twitches and jerks in exact echoes of the musical dynamic. On another level, it is an encounter between a male voice and a female body. 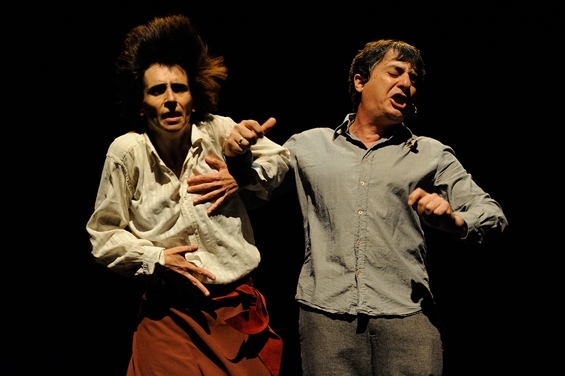 George’s only actions – fingers drumming, arms marking time – are extensions of his own voice, to which Milena, all body, seems brutally chained. She flinches and flails, covering her breasts and crotch as if in fear and shame. Even when George is absent, his offstage voice still dominates, and even when they tentatively link arms, the relationship feels abusive: she is yanked to his rhythm. Manlike was inspired by stories of women who dressed as men to survive, but what comes across is a simpler story – an enactment, even – of female subjection and sexual humiliation. It makes for disturbing viewing.